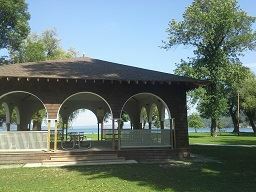 There are approximately 25 picnic tables inside the pavilion and several around the outside of the pavilion which seat about 6-8 people each. There are also a number of picnic grills surrounding the pavilion as well as a large barbecue pit (bring your own grates) for your cooking needs. The pavilion is in the heart of Stewart Park just off the exit on Route 13. It is located toward the back of the park in the playground area. There are 12 picnic tables inside the pavilion and several around the outside of the pavilion which seat about 6-8 people each. There are also a number of picnic grills surrounding the pavilion for your cooking needs.